Sugar Hill E-Liquid Review - Daily Vaping Deals & The Best Vape Product Reviews at Vaping Cheap! 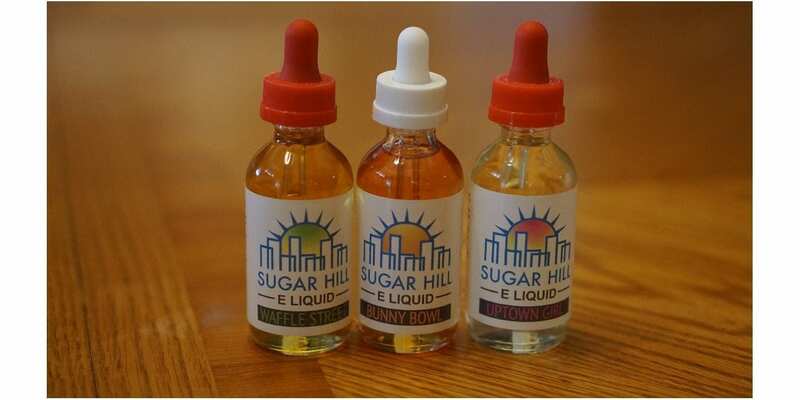 In this review, we will be covering three different flavors from the Sugar Hill E-Liquid line! Sugar Hill E-Liquid offers 9 unique flavors, and offer 60ml and 120ml bottle sizes. The standard retail price for a 60ml bottle is $19.99 and for a 120ml bottle only $29.99. They do run deals quite frequently, so be sure to check back Vaping Cheap to see if there are any coupon codes available! In addition, they nicotine strengths they do offer is 0mg, 3mg and 6mg. All of their e-juice have high VG blends, so you’ll be getting excellent flavor and vapor production! Not to mention, these high VG blends are great for sub ohm tanks, RDAs, RTAs and RDTAs! The specific flavors that will be reviewed are Bunny Bowl, Waffle Street and Uptown Girl. Before getting any further, I would like to thank Sugar Hill E-Liquid for sending these e-juices my way for the purposes of this review. I will give you my overall thoughts about each flavor and let you know whether or not I recommend it! Remember, taste is subjective, so what I may like you may dislike and what you like I may dislike. I will first go over the specific mods and atomizers used to test each of these flavors and then will continue on to the review of Sugar Hill E-Liquid! Shop Sugar Hill E-Liquid Here! Click Here to Check Out Sugar Hill E-Liquid! Flavor Description: A bevy of fruits blended into the heart of a gum, a truly juicy vape juice. Every puff will feel like a fresh stick of fruity gum. So tasty and fruity your brain will think you are actually chewing gum. The perfect candy vape. This is a pretty straightforward flavor, and tastes exactly what is said in the flavor description. On both the inhale and exhale, I get the same fruit bubblegum flavor. However, on the exhale is where you can really taste the fruits. The throat hit on this one is a bit more throaty than I would prefer, but it’s not terrible by any means. The more I would vape it, the less noticeable it was. I usually vape 1.5mg, so it might just be me being sensitive to 3mg. I honestly can’t pinpoint exactly which fruit I’m tasting. It does taste like a bunch of fruits with bubblegum surrounding it just like if you chewed into an actual bubblegum. This is a pretty thick e-liquid as well, which is great for your sub ohm tanks and RDAs. With that being said, the vapor production is top notch with this one! Not to mention, the flavor is not too light nor is it too heavy which is great. All in all, this is a solid fruit bubblegum flavor, and it does get some points since it completely matches the description. If you’re looking for a good fruit bubblegum flavor, then Uptown Girl by Sugar Hill E-Liquid I would highly recommend checking out! Flavor Description: A bowl of your favorite fruity cereal that produces a euphoric flavor experience you will recognize instantly. Truly creamy and a mixture of fruits in this iconic cereal you won’t want to put down. Cereal flavors have been done by tons of different e-liquid companies, and a lot of them taste quite familiar. This one I can say does taste a bit different and is definitely on the creamy side, which really makes this e-juice stand out in my opinion. On the inhale, I get a fruity cereal flavor. However, on the exhale I get a nice creamy fruit cereal flavor. There are hints of lemon in there, but it’s very subtle. I know there are tons of cereal flavors where the lemon might be too overwhelming and in even some cases taste like lemon pledge. I’m glad to say this one doesn’t. There are other fruit notes as well, just like if you ate a spoon full of fruit cereal and milk. All in all, this is an excellent fruit cereal flavor. While I am not the biggest fan of cereal flavors, this is one that I can vape most of the day without getting tired of it. If you’re a fan of milky or creamy fruit cereal vapes, then you won’t be disappointed with Bunny Bowl! Flavor Description: Fresh Belgian waffles just like mom used to make. Buttered with a brown sugar butter and topped off with a smooth syrup that would make a maple tree jealous. Rich hearty flavor in a smooth vape. This is a pretty interesting vape, and I’ve never really had any e-juice that had brown sugar as a main flavor note. I’ve had plenty of different flavors where it features waffle and maple syrup and you do get these flavor notes in this e-liquid. On the inhale, I mainly get a maple and brown sugar taste. However, on the exhale is where this flavor comes together. Right as you exhale, you do get the same maple syrup followed by the brown sugar, but there are waffle and buttery notes in the background. The buttery note gives it that creaminess that makes this e-juice pretty tasty. The maple syrup and brown sugar are by far the most dominant flavors, with the maple syrup being the most dominant. I do wish the waffle and buttery notes were more noticeable. All in all, this is a solid breakfast flavor. All of the flavor notes are present, which is a big plus in my book. If you’re a fan of these types of flavor profiles, then I definitely recommend trying out Waffle Street! In conclusion, all three of these flavors from Sugar Hill E-Liquid are tasty and vape great! In addition, all of these flavors were rather thick, so they vape great in both sub ohm tanks and RDAs! I do like how each flavor is unique in regards to its blend rather than having a specific VG/PG ratio for the entire line. To me, this is a huge plus! The prices of these e-juices are quite good as well, and sometimes they do offer pretty steep discounts, so be sure to check back! My favorite of the 3 that were reviewed was Bunny Bowl. Like mentioned previously, I am not the biggest fan of cereal vapes, but this one specifically vapes a bit different and is very creamy. The creaminess is what makes this e-juice that enjoyable, and keeps me coming back for more. I’m sure vapers who love candy vapes will certainly enjoy Uptown Girl, as it’s a spot on fruit bubblegum flavor. All in all, Sugar Hill E-Liquid offers some pretty tasty flavors at affordable prices. If you’re looking for a new e-juice company to try, then I can easily recommend checking them out!